top-quality, state-of-the-art test instruments. If your tester is from Fluke Networks, you expect it to be accurate. Why Calibrate with Fluke Networks Authorized Service Centers? When you receive an email or a LinkWare Live™ notification from Fluke Networks, saying it's time for your tester's yearly calibration, you might wonder, "Why does my tester need to be calibrated? It doesn't have any moving parts to go out of adjustment, does it? How do they calibrate my tester? Do I really have to send it back to Fluke Networks? Or can I send it to some other lab that will get it back to me faster?" These are completely valid questions, especially since you can't use your tester when it's out for calibration (unless you have membership in a Fluke Networks Gold support program that provides you with a free loaner during calibration and repair times). But let's take a look at some potential situations that might occur if you don't have your instrument calibrated. For example, what if your job requires tight tolerances and accurate measurements? Can you afford to provide your client with potentially incorrect reports? What if you have inconsistent test results between your testers? What happens in case of a dispute between you, your customer, and the cabling system vendor? Calibration is the testing of test equipment to ensure its accuracy. The primary goal of calibration is to test your Fluke Networks testing products for inconsistencies, and if necessary, make repairs or adjustments to correct them. This way, you can prevent those inaccuracies from ever occurring. If your organization has implemented an ISO 9001 quality management system, you're required to calibrate any measuring equipment you use to verify or control quality. Not only that, all such calibrations must be traceable to national or international standards. Calibration dates are also included on test reports, so if there's a dispute regarding your cable installation, and your reports show your tester was out of calibration, those reports will be worthless in arguing your position. In addition, cabling and connecting hardware manufacturers issue multi-year product and application warranties based on audits of test data. To receive the warranty, you're required to collect this data using instruments with a valid calibration, and you must do testing in accordance with the manufacturer's specification and time scales. Therefore, to receive payment for a job, you must successfully certify thousands of links. Your Fluke Networks tester is made up of stable components, including resistors, capacitors, and integrated circuits. But like any other electronic product, the performance of these components changes over time. Temperature, humidity, and storage/transport conditions can cause variations in your instrument. Even in a controlled environment, the circuits in your tester warm up and cool down as you turn it on and off throughout the product's life cycle. The circuit board can be contaminated by dust or other outside materials, or the components may be damaged if you accidentally drop the instrument on the floor, or if it bounces around inside your vehicle on the way to an installation job. A faulty tester can cause havoc in various ways. For instance, if your certification test yields false passes of bad links, future users of that system could experience networking problems, traceable to the cable plant. Your client might bring legal action against your company based on the faulty links, and you'd be responsible for reworking and repairing them. On the other hand, if the tester fails good links, your company will spend needless time and money fixing links that don't need to be repaired. A properly-calibrated instrument helps you avoid these issues, ensuring that your tester works as well as it did the first time you ever used it. Fluke Networks has 13 authorized service centers throughout the world. Each of these laboratories has at least one copper calibration station, for calibration of copper testers. Additionally, seven of our authorized service centers can calibrate fiber testers. 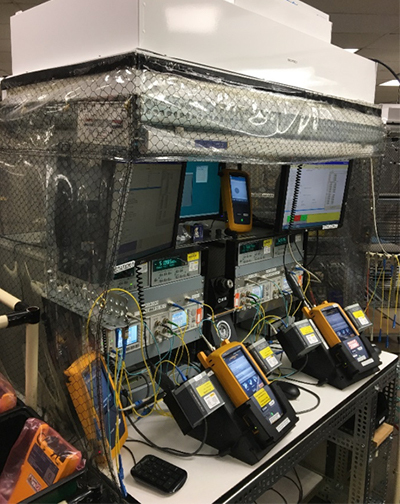 In calibrating your DSX CableAnalyzer™, Fluke Networks utilizes a series of seventeen testing devices (Figure 1) that plug into your instrument. These testing devices are called calibration artifacts. Each custom-made artifact is designed to test and calibrate a different measurement, such as NEXT and FEXT, insertion loss, return loss, attenuation, and resistance for all four pairs across a full range of relevant frequencies. Each artifact contains complex circuitry, and the entire set of copper calibration artifacts has a total value of $10,000. Figure 1 - Copper calibration station. Seventeen custom designed artifacts are connected to the Versiv unit in sequence in order to calibrate it. The automated wheel setup is used only in the factory in order to handle production volumes. Figure 2 - Fiber calibration station. Note the plastic around the station on the filtration system on top to reduce dust. Some of the commercially available products used are modified by Fluke Networks to meet our accuracy requirements. When you send a copper or fiber tester to a Fluke Networks authorized service center, we precisely calibrate your instrument to factory specifications, using a full range of proprietary test procedures and custom equipment. A non-authorized laboratory does not have access to Fluke Networks' proprietary testing equipment and procedures. They may only calibrate basic measurements such as length or resistance, and may not test your products for accuracy across a complete range of frequencies. For example, they may only test your product at 10, 100, 1000, and 2000 MHz, where a Fluke Networks authorized service center would test at hundreds of frequencies, from 10 through 2000 MHz. Our calibration procedures and artifacts are based on Fluke Networks product designs, and on the mammoth amount of data we collect from calibrating tens of thousands of units over years of usage. We tailor our procedures to test for inaccuracies in places where they are most likely to occur in our products. A non-authorized testing lab will not have the same depth of knowledge, and may not know which combinations of measurements and frequencies to test, or which inaccuracies to look for, in Fluke Networks products. The artifacts and equipment used for calibration must occasionally be calibrated themselves, to ensure that they will continue to accurately measure the performance of Fluke Networks testers according to national standards. Every year, our authorized service centers send their artifacts back to the Fluke U.S. Service Laboratory in Everett, WA, where they are tested for accuracy against even more accurate standards that are traceable to the Fluke Everett Primary Electrical Laboratory or to the National Institute of Standards and Technology (NIST). A non-authorized testing lab may not offer traceability to national standards, and therefore may not be able to provide certification for the accuracy of its measurements. Fluke Networks immediately informs all authorized service centers of any product changes or issues, and how to fix them. For example, we recently discovered that if you drop a certain instrument several times, the battery contacts may become deformed, which causes an unreliable connection between the battery and the unit. Fluke Networks engineers created a fix for this problem, and notified all authorized service centers to perform this repair on all units sent in for calibration. Since non-authorized testing labs don't receive Product Change Notices from Fluke Networks, they can't inform you of product changes, or perform preventive maintenance on your instruments. 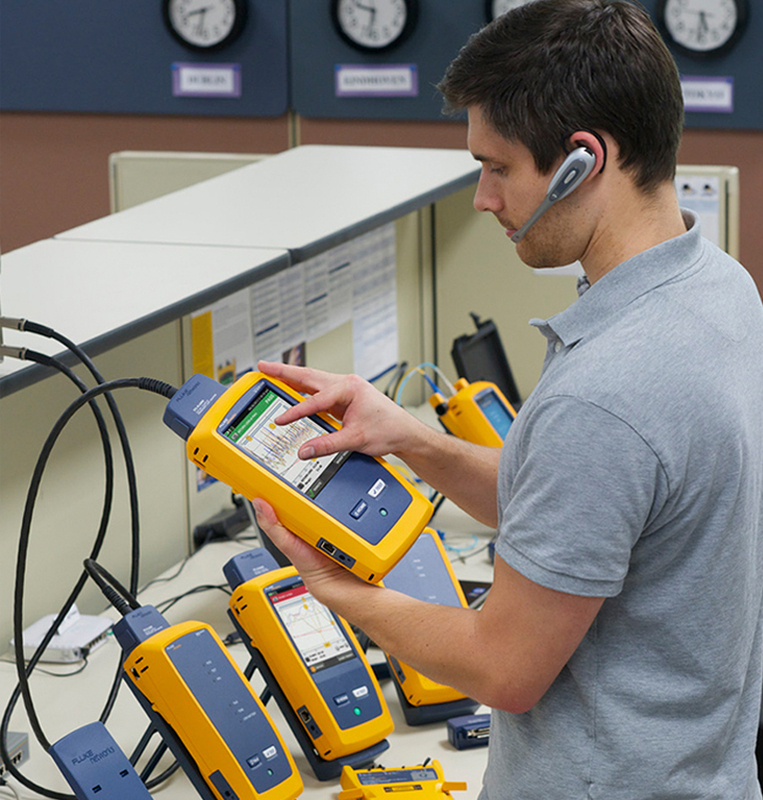 At Fluke Networks authorized service centers, the engineers don't simply test your instruments. If the measurements are off, we also make necessary adjustments or repairs, using genuine service parts. We apply software and firmware updates, test all accessories and replace them if they are defective, clean your tester, and verify its performance. A non-authorized testing lab can only test your instrument and tell you if certain measurements are off-calibration from the standard. But they can't provide the necessary fixes or updates to ensure the level of accuracy you've come to expect from Fluke Networks instruments. Figure 3 - One of the seventeen copper calibration artifacts as used in our service centers. Encased in plastic shell for protection. Figure 4 - Data collected from a single Versiv unit after testing from just one of the seventeen artifacts. Fluke provides calibration instruments that are so accurate that they are used by national standards laboratories throughout the world, including the including the United States' National Institute of Standards and Technology, as their calibration standards. In other words, the people who create calibration standards rely on Fluke equipment to help them establish those standards. Calibration is a smart choice, with a high Return On Investment (ROI). Without calibration, your labor, costs, and potential for trouble with dissatisfied customers go up, and your efficiency at testing networks goes down. Having your testing instruments calibrated ensures that you will always get the most accurate measurements, and gives you confidence that the product will always work as designed. Additionally, calibration extends the life of your product, helping you avoid downtime by repairing or replacing components that might cause the tester to fail. 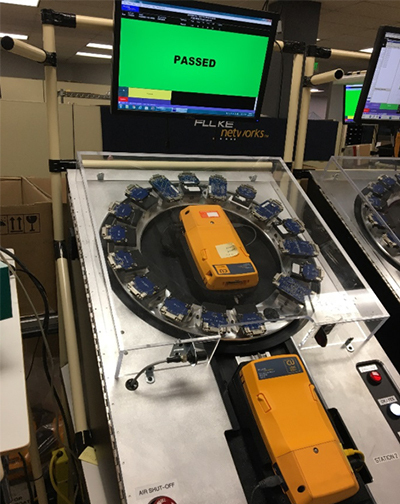 Only Fluke Networks has the in-depth knowledge about the design and performance of our own testing products, and the calibration equipment that can ensure its accuracy and reliability. Also, Fluke Networks is the only place that can properly service your product, and guarantee that it performs to all published specifications is the manufacturer. You can trust your tester to Fluke Networks and the calibration service we perform.